Not to be confused with Canopy Tents or Pop Up Canopies, these are not the same. In essence they are both instant shelters that set up within minutes and provide a shaded, waterproofed area. However this is where the similarities end. 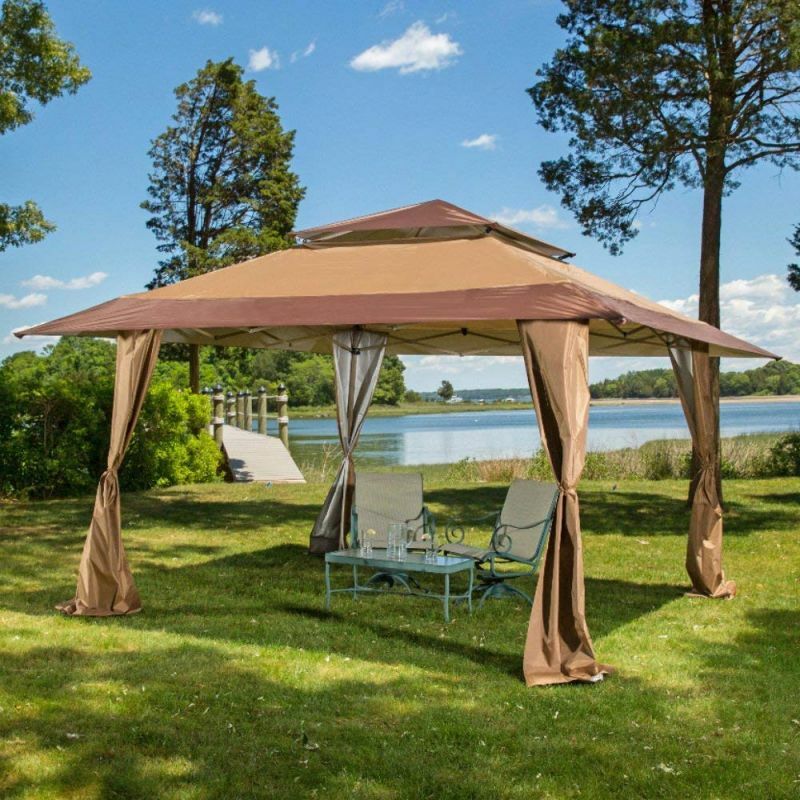 Gazebos utilize an entirely different design and aesthetic than their canopy counterparts. Their price, materials and purpose of use differentiate also. The Gazelle, Clam and Coleman models are popularly used for camping trips, given the full enclosure of meshed side-panels and walls, making them perfect for family camping. But which models are right for you and which should we use for camping or the garden? Pop up gazebos have a vast size range and also there is an abundance of different uses. Luckily, they are not all designed the same. We talk more about their uses below in the FAQ. However, if you’re in the loop and know what you’re looking for, then let’s begin. We ordered this list by size and kept a variety of types for camping and garden. 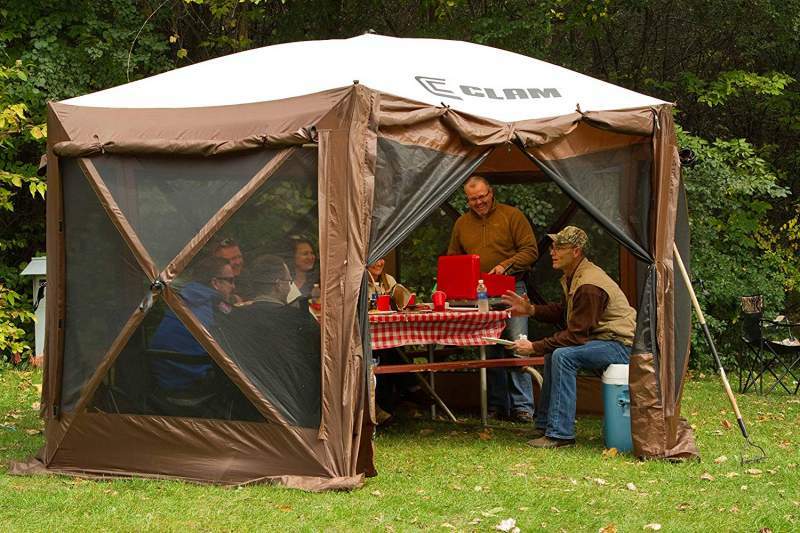 We will kick this off with an awesome pop up gazebo for camping from Clam Corporation. Clam have been producing portable, lightweight and fast pitch gazebos, which are tuned towards camping. An extremely wide range with the quick set escape, escapeXL, traveler and the popular pavilion models all available online. A premium choice with a high sell rate, let’s find out why. This camping gazebo assembles in under a minute, and can be done alone. Open up the packaging and lay it flat on the ground. After, open out each hub, there are 5 in total, which make up each side panel. Then push up the center hub to secure all framework together, it will be fortified once you hear the clicking sound. Finally, after use, fold back in the same fashion in reverse, and place it back in its carry bag for safe storage. Job done. The sides of the portable gazebo have built in wind and rain panels to help in fighting off any unwanted weather conditions. The zippered weather panels are also adjustable, meaning you can customize it against wind or sunlight, depending on the position of the sun. Adjustable to create a low level breeze if the interior needs airing out. It’s waterproof with a resistant roof and taped seams, the meshed windows are also created with a fine mesh that reduces visibility from the outside. Offering some privacy when needed. 110 square foot of shaded ground, from within. Capable of fitting more than 6-8 people easily. Smaller models advertise as 6 people. Stays cool and dry inside thanks to the meshed panels. Plenty of space for a large camping table and a few fold up chairs. 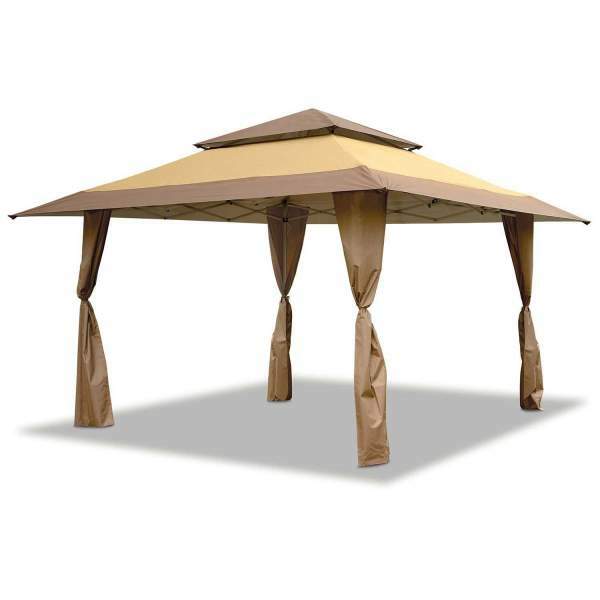 An excellent gazebo for camping or garden events for a small group. 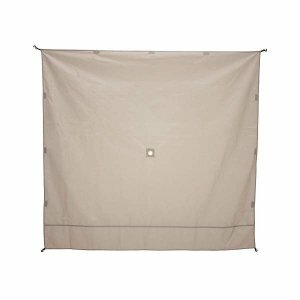 Comes with the weatherproof panels, which is rare for Clam, they are usually sold separately at $48 each. Just be careful, remember that these are just pop ups, if you can, don’t leave them set up for months on end, take care of them and store them away safely after use. Next up, we have a 13×13 pop up for garden and patio from Cloud Mountain. 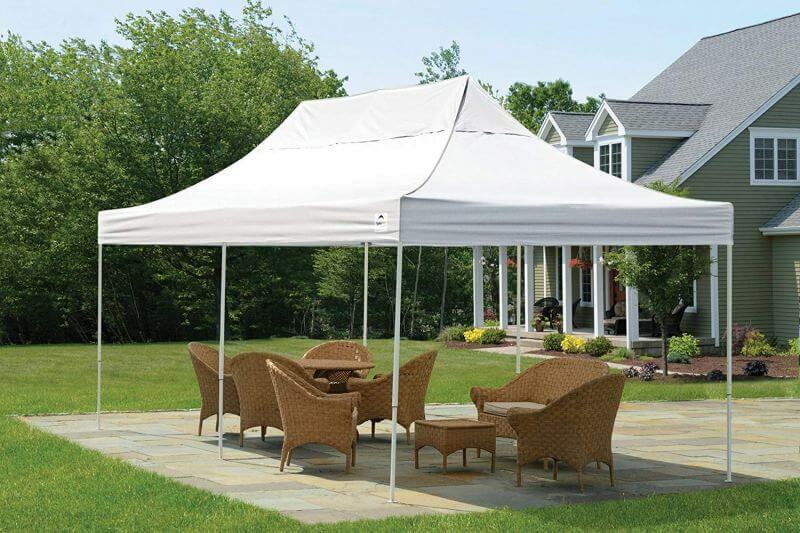 This is a sturdy yet beautiful piece that is suitable for garden parties, barbecues and a sunshade for the family. It has a classical appearance with 4 color choices. Let’s see what’s hot and what’s not with this portable patio gazebo. With 4 color variations, brown/beige, brown/tan, royal blue tan and hunter green tan. The Tan and Beige will blend well with stone houses, conservatories and patios. The Blue goes well poolside or on the lawn. The legs also match the chosen color theme, so the roof and legs will be the same. Erected it stands at 154 x 154 x 110 for length, width and height respectively. Giving a shaded area of 169 square foot. Steel frame, but still pretty lightweight at 34lbs in weight. Easily carried around in its carry bag. It has adjustable straight legs with 3 different height variations. The frame is protected with a powder coating that resists water, rust and corrosion. The fabric is made from 210 Oxford Fabric which is a decent protective material. This newer model includes an over-sized roof, which creates a larger shaded area. It measures up at around 46 x 46 in inches, and will contain the color chosen upon purchase. 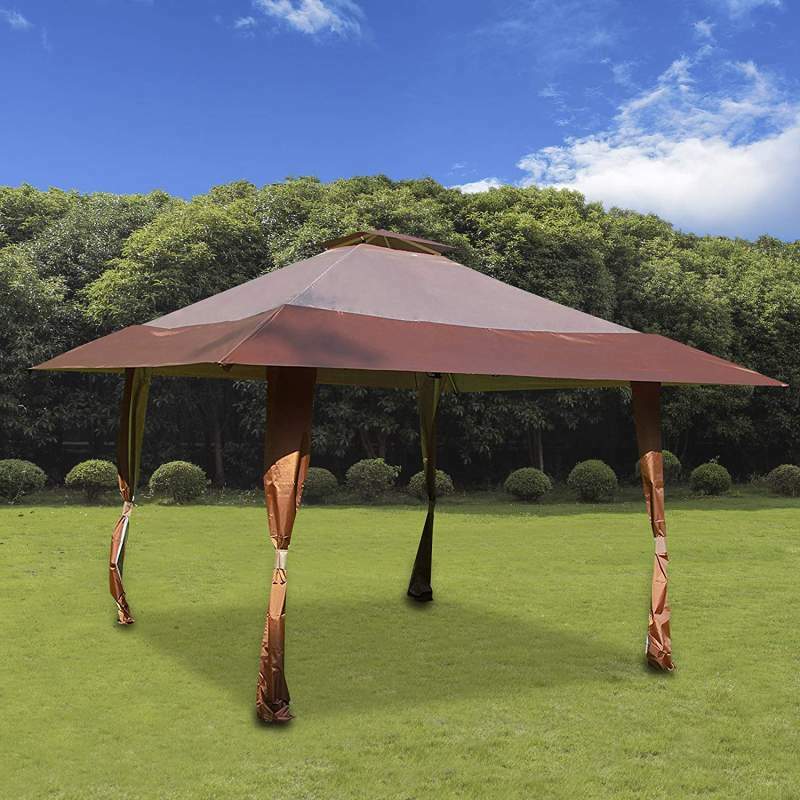 It works well as a portable, lightweight pop up gazebo that you can use in the garden or patio, to shade you and your friends, for occasional get-togethers. However it is not meant to be left outside in the weather for extensive periods of time. Try to pack it away and store safely after each use to enjoy longevity in this model. Our 2nd pop up gazebo designed for camping and outdoor use. 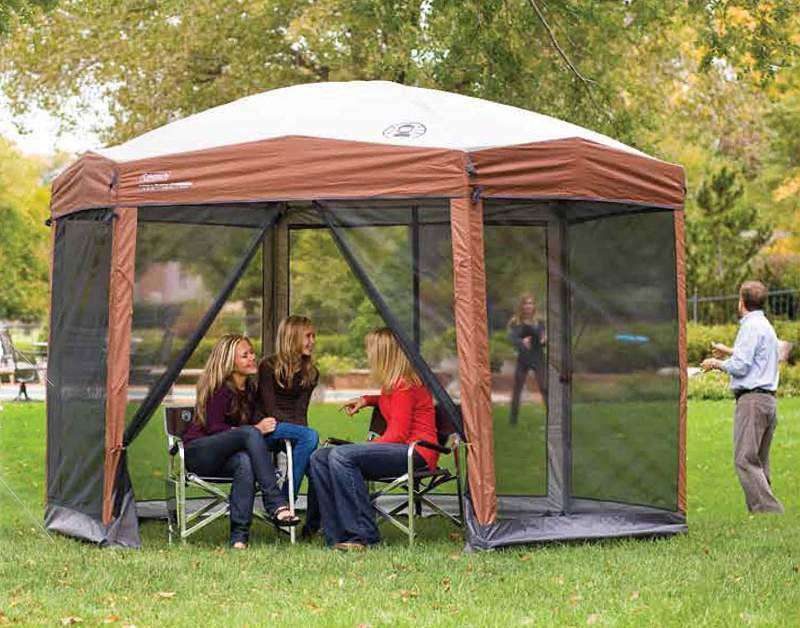 The 8 person portable gazebo from Gazelle, much like the addition from Clam. However without all the bells and whistles and a more economical choice. If you scroll down to the FAQ you will see an actual video of this gazebo being assembled, to give you an idea of how easy it is to pitch. They also have another smaller 4 person model. 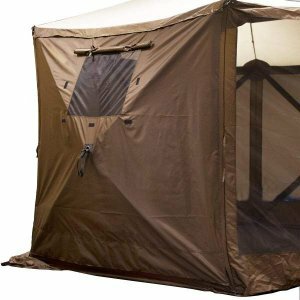 Let’s check out the features on this portable camping gazebo. Offering a huge center height of 7.2 foot, it’s taller than most instant cabin tents. It has 92 square foot of shaded space for you to relax in. The size when assembled is 124 x 124, to give you an accurate idea of the size. Also lightweight at 34lbs in weight, it’s easily carried and lighter than the Clam edition. It’s suitable for a picnic table inside with 6 chairs, to enjoy with the family or camping group. Starting with the roof, it’s made with Polyester material, which has been integrated with UV resistant properties. It offers great protection from the sun. Also they have reinforced the corner joints, which are usually weak points on hexagonal shaped gazebos, as there are so many corners, nooks and crannies for the rain to filter into. Reinforced with heavy duty material, that is sewn into the corner joints, to prevent any leaking issues. It only has 1 entrance and exit in the form of a single front door panel. However, this has been fitted with a YKK zipper which is durable and water-protected. Unlike the Clam, the Gazelle gazebos wind panels are sold separately. As is the norm for all other Clam gazebos too, the quick set pavilion being an exception to the rule. They have packs of 2 or 3 available, so for the 6 sided hub I would recommend a 3 pack and maybe a 2nd pack for full surrounding coverage. The Gazelle wind panels can be seen here. Click for further info. Made of 210D Polyester material, they are fully waterproof and offer good protection from light rainfall and moderate winds. Additionally they are attachable to any gazebo from Gazelle. They have also created a 5 sided version which is designed as a 4 person camping hub. If the 8 person is going to be way too big for your smaller group, consider this. It has the exact same features as the 6 sided hub, only smaller dimensions. The 5 Sided Hub from Gazelle. Similar in dimensions to the Cloud Mountain, however this model has a stunning double roof in a pagoda style. With a set of string lights this can set the scene beautifully for any social occasion, in your garden or patio. Also an insta-lock frame for extra safety when pitching and storing. Let’s check out what else this shelter has to offer. This model is insanely easy to set up. Can be up within minutes of unpacking, just simply extend and attach the pagoda style roof cover to the frame. The legs have attachments for mosquito nets and wind panels but unfortunately they are sold separately. It all can be stored away safely into the free roller carry bag. The frame is steel which weighs in at around 59lbs in total. Coated with rust resistant powder to fight the elements when kept outside for a long duration. The total canopy size is 13×13 with a 10×10 footprint. This offers around 170 square foot of shade, which is especially big due to the extended pagoda roof. The center height is tall and stands at 9.6 foot. 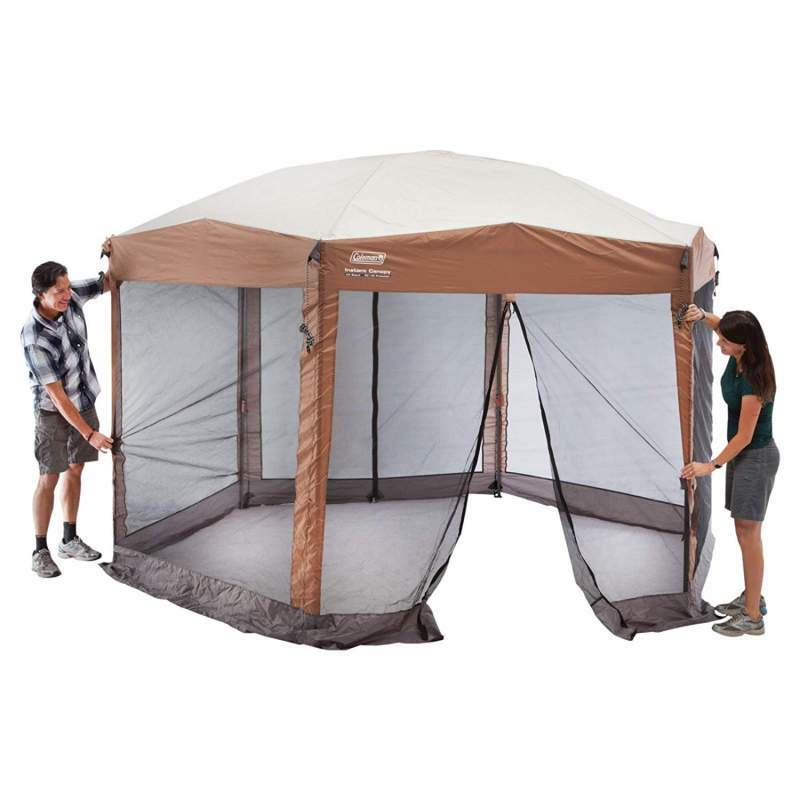 As mentioned there are meshed side panels to keep out bugs and insects, which fits perfectly with this portable gazebo. However, they are sold separately. They attach easily to the legs and frame, and have full zippers integrated into the lining. 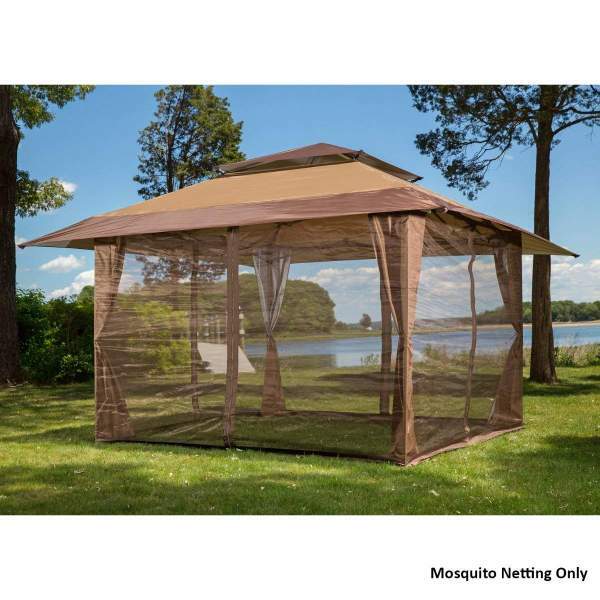 Separate Mosquito Netting Panels will attach to all Gazebos and Canopies up to 13×13. Made with fire retardant fabric they are safe to grill or bbq with and the purchase also comes with all 4 side-panels. You can customize accordingly, creating 1-2 doorways, or connect all 4 for full coverage. In fact these panels fit most pop up gazebos that have a 10×10 footprint. 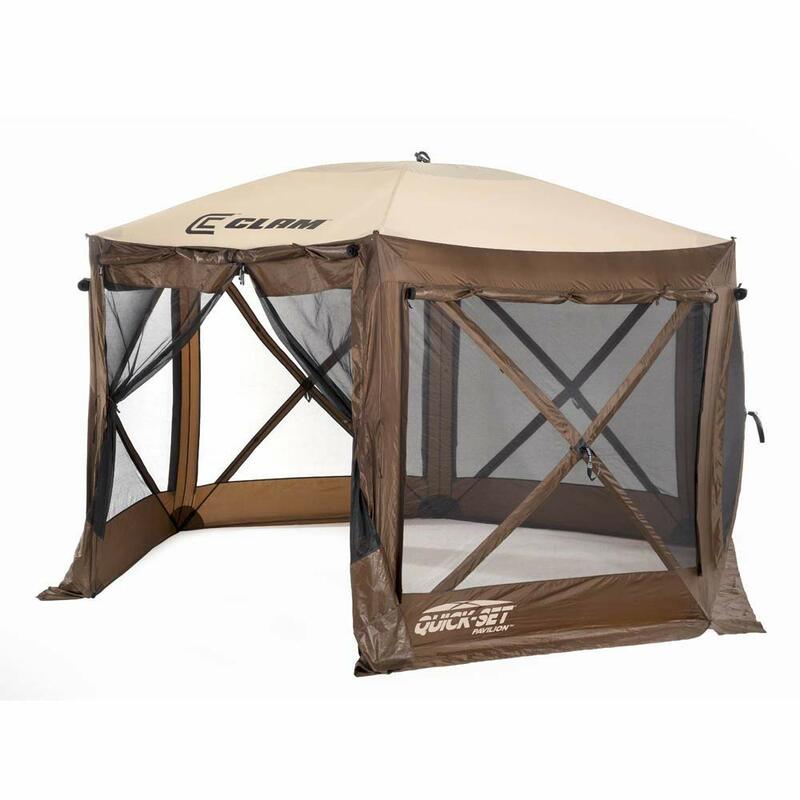 Our last addition in our list is an instant screen house from Coleman. With the hexagonal shape, pop up design, attached framework and meshed screened sides, this definitely qualifies for camping with the family. This brand famously offer instant set up tents, canopies and gazebos that are easy to set up and use. Let’s look more closely at our final review. The whole frame is protected by a screened shelter that surrounds the gazebo. 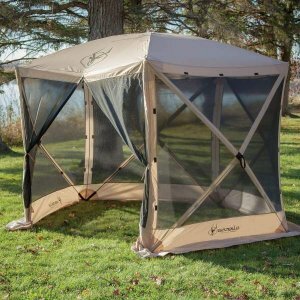 The fine meshed side panels gives protection from mosquitoes, bugs and all those creepy crawlies, as the mesh is to fine for them to fit through. The roof and other fabric is made of a durable material knows as Polyguard, which is an extra thick and long lasting material. It’s designed with an UVGuard, which is integrated into the fabric. The provides adequate sun protection and can protect your family with a factor of 50+ UPF. In true Coleman style, it’s an incredibly easy set up. You can pitch this alone and have it set up and staked within 3-5 minutes. Afterwards, it’s just as simple to fold away and make sure that you do this after each use. It can be stored in the easy pull storage back, that has wheel attachments so you can pull it rather than carrying it around from A-B. Perfect for camping with friends and family, also makes a great picnic shade for the table. You can attached LED lights inside to create a relaxing ambiance. 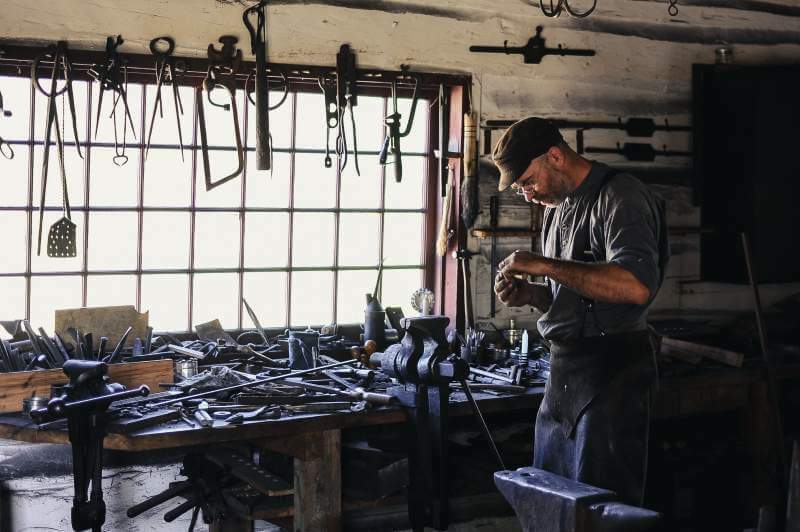 If you store away safely after each use, proof the roof with proofing spray and try to avoid severe weather conditions and it will outlast its very reasonable price tag. What is a Pop up Gazebo? Basically the modern equivalent of a standard gazebo. Focusing on an instant set up, light carry weight and portability. They are an easy set up shelter which can be used in a variety of situations.They are generally used as a camping hub tent or as a patio and garden shelter, for the more aesthetic models. Both contain side panels and meshed panels, which are either attachable or integrated, depending on the style. For patio options, lights are attachable to create a nice environment for garden events. 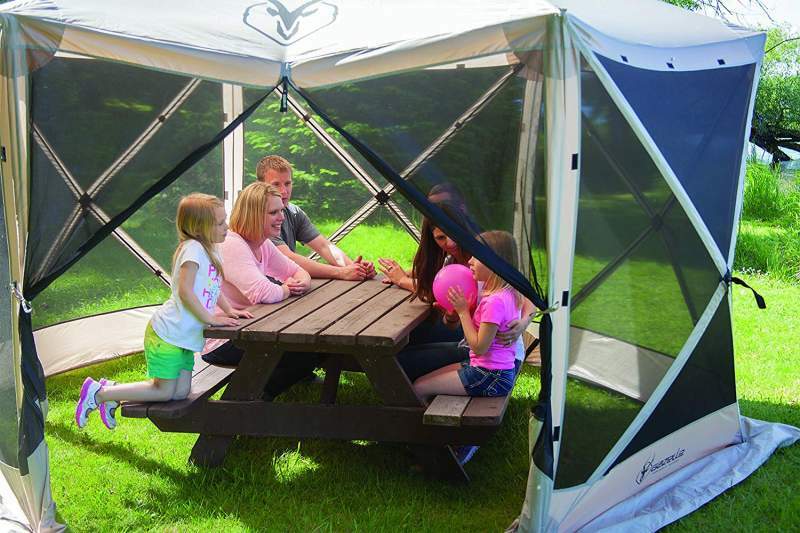 The camping style gazebos offer perfect shade and spacious rooms to fit in the camping table and chairs. How do Pop up Gazebos work? The larger portable garden and patio gazebos will most likely come with a pre-built aluminum or steel frame. This will be firstly extended around 70%, then have the cover/roof attached, then fully extended. Much like a car canopy. Some of the more rigid roofs made of aluminum or other non-pliable material will be attached after full extension of the frame. Then finally, securing the gazebo with weights, guy lines and stakes, depending if you set up on soft or hard surfaces. The camping gazebo versions are much simpler to assemble. They come pre-assembled in a complete frame with fabric already integrated into the framework. Assembled by extending the pre attached poles outwards, unfolding the framework, taking shape as you extend it. Next secure with pegs an stakes once it’s fully opened. Apply any rain-cover or flys after the frame is fixed. Additionally lay any tarp for extra flooring. That’s it, job done. Are Pop up Gazebos Waterproof? They do vary and some are better than others. All the pop ups listed in our article have waterproofing properties in the fabric. However it is worth noting the portable versions generally aren’t as robust as traditional gazebos. The polyethylene and polyguard models do resist water penetration and with care after each use, can last as a decent outdoor shelter. To conclude this article, pop up gazebos are a lightweight and multi-functional shelter that can be used in a variety of situations. Garden, patio and camping scenarios alike. All of which are waterproof and do a good job sheltering against the elements. I think the most important thing to realize when buying, is the fact that you cant just leave them outside in harsh weather for weeks on end. For best practice, try to store after use and make sure its dried out before storage to prevent mold build up, which can eat away at the fabric, weakening it. All in all an excellent and economical choice of instant shelter for camping and garden events. We hop you enjoyed reading this and found it useful, please share on your social media pages if it was. Any questions? submit below and we will reply as soon as possible.